History: (What If? II#22) - When Galactus created a barrier to keep the Silver Surfer from leaving Earth, Mister Fantastic invited him to join the Fantastic Four, which he did. Together with them, he helped defeated numerous villains such as Annihilus, Doctor Doom, Mole Man, Terminus, and the Frightful Four. Despite the victories, the Silver Surfer remained lonely and unable to leave Earth, not even when the other F. F. members left to participate in the Kree-Skrull War. One particular night began as Father Coen of St. Ezekiel's Cathedral phoned the F. F. Hotline asking for help with a supernatural problem and asked that the F. F. help, not wanting to bring the occult Dr. Strange into the holy church. The team finally agreed and arrived at the Church that night to find that Father Coen was possessed by Mephisto. Mephisto easily opened a portal to his splinter realm and began torturing the Fantastic Five by submitting the original four members to their worst fears while promising their freedom if the Silver Surfer agreed to stay in Mephisto's Hell. The Surfer agreed, but announced that his word was his bond and that he had no need to sign a contract with Mephisto. Mephisto angrily replied that in his realm, the Surfer would act according to his wishes and to show he was serious, Mephisto burned the Human Torch alive, killing him. Silver Surfer finally signed the contract and agreed to remain behind in Hades to save the Earth from Mephisto's evil. Upon the return of the remaining Fantastic Five members, Father Coen asked what had happened and Mister Fantastic explained that Johnny was now dead and the Silver Surfer was trapped. Without Mephisto's influence on the Earth, peace began to sow around the world, with men no longer turning weapons on one another. In the years that followed, Franklin Richards graduated college with his doctorate and Captain America laid down his shield as heroes were no longer needed in a world of peace. The Punisher also put his guns away as the Silver Surfer announced to Mephisto that with his demons occupying the Surfer, evil was washed away from humanity. Mephisto proudly announced that his evil only slept and he quickly spread his evil influence once again on humanity, causing abuse, destruction, and murder. 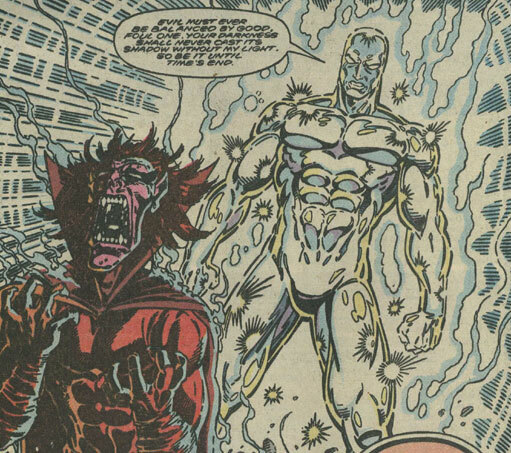 Angry that the Silver Surfer still defied him, Mephisto killed his physical body only to have the spirit of Norrin Radd live on, given power by his own good spirit. Since the Surfer's contract with Mephisto was for eternity, the Surfer remained in Hades, the light of his spirit burning Mephisto for an eternity. Comments: Created by Ron Marz, Ron Lim, and Terry Austin. This reality diverged when the Champion of the Universe never arrived on Earth, which would have led to the Silver Surfer's discovering a means of leaving Earth. 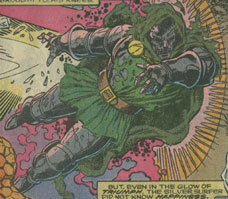 Annihilus was the same as his Earth-616 counterpart. 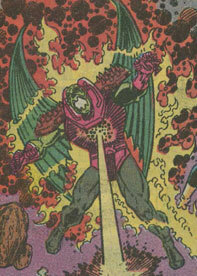 With the Surfer joining the Fantastic Four, Annihilus was soundly defeated with their extra might. He presumably had the same abilities as his 616 counterpart. Captain America was the same as his 616 counterpart up until peace spread across the world without Mephisto's influence. 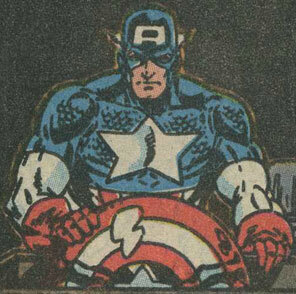 Since heroes were no longer needed, Captain America laid down his shield for good. He presumably had the same peak physical abilities as his 616 counterpart. The head of St. Ezekiel's Cathredal, Father Coen phoned the Fantastic Five Hotline and asked their help with supernatural problems. He declined the suggestion of Dr. Strange due to Strange's occult connections, so the F. F. soon arrived to aid him. When they arrived, they found Father Coen possessed by Mephisto and Mephisto easily captured the Fantastic Five. When they were freed, Coen (back in his right mind) asked what had happened to the Human Torch and the Silver Surfer, to which Mister Fantastic replied that Johnny was dead and the Surfer wouldn't be coming back. The remaining F. F. members then left the church, telling Coen that he would have no more supernatural problems. While possessed by Mephisto, Father Coen had superhuman agility and was able to walk on walls. He radiated with evil energy and could manipulate objects around him, such as moving parts of the church to form a trap around the Fantastic Five. He was also able to generate hellfire and teleport others into Mephisto's realm. Doctor Doom was the same as his Earth-616 counterpart up until he was easily defeated by the joining of the Silver Surfer to the Fantastic Four's ranks. He presumably had the same sorcerous abilities of his Earth-616 counterpart. The Fantastic Five were the original Fantastic Four members with the Silver Surfer. Together, they easily defeated Annihilus, Terminus, Doctor Doom, the Mole Man, and the Frightful Four. They shared many adventures together and even set up a Hotline to help others. When they were asked to help out St. Ezekiel's Cathredal, they were captured by Mephisto and the Human Torch was killed. They were returned only on the condition that the Silver Surfer remain in Hades, leaving only the Invisible Woman, Mister Fantastic, and the Thing to return to Earth. They were (from left to right): Invisible Woman, Silver Surfer, the Thing, Mister Fantastic, and the Human Torch. The Frightful Four were a team of Fantastic Four villains who were soundly defeated by the arrival of the Silver Surfer to the Fantastic Four's ranks. 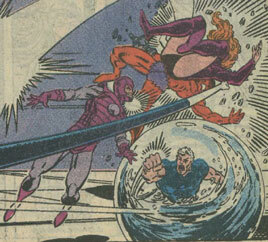 They were (from left to right): Wizard, Klaw, Titania, and Hydro-Man. The Human Torch was the same as his Earth-616 counterpart up until the Silver Surfer joined the Fantastic Four. Johnny Storm remained the cut-up of the group, often picking on the Thing, and joined the team when they tried to help St. Ezekiel's Cathredal. While there, the team was captured by Mephisto and subjected to their worst fears, Johnny's being the fear of burning alive. When the Silver Surfer refused to sign a contract with Mephisto, Mephisto burned Johnny alive to show his power, killing Johnny instantly. The remaining Fantastic Five returned to Earth when the Surfer relented and agreed to sign the contract. Human Torch had the same fire-manipulating abilities that his Earth-616 counterpart had. The Invisible Woman was the same as her Earth-616 counterpart up until the Silver Surfer joined the Fantastic Four. 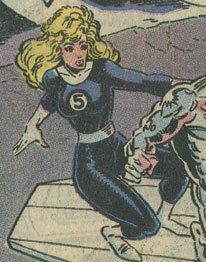 As the team became the Fantastic Five, Sue Richards joined them on numerous missions. She eventually accompanied the team on a mission to St. Ezekiel's Cathredal where Johnny Storm was killed and the Silver Surfer captured by Mephisto. Years later after Mephisto's influence had left the world, Sue was proud to see her son Franklin graduate college with his doctorate. Sue had the same invisibility and force-field generation powers that her 616 counterpart had. 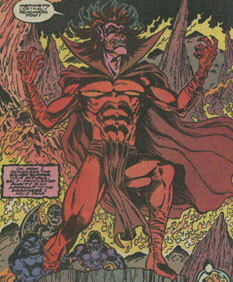 Mephisto was the same as his Earth-616 counterpart up until the Silver Surfer joined the Fantastic Four. Striving to corrupt the Surfer and possess his soul, Mephisto led the Fantastic Five into a trap at St. Ezekiel's Cathredal where he killed Johnny Storm and forced the Surfer to remain in Hades for an eternity. When the Surfer chastised Mephisto for losing his control over the Earth, Mephisto immediately took his control over Earth back, freeing the Surfer from his demonic bonds but not from his contract. The Surfer then pushed Mephisto into killing his physical body, causing his spirit to arrive in Hades due to the contract. The light that his spirit radiated then burned Mephisto for the eternity that was his contract. Mephisto had the same powers as his Earth-616 counterpart. Microchip and the Punisher were the same as their 616 counterparts up until Mephisto's influence was wiped from the Earth. Without evil to battle, the Punisher put up his guns for good. Mister Fantastic was the same as his Earth-616 counterpart up until the Silver Surfer joined the Fantastic Four. Together with the Surfer, the newly-named Fantastic Five shared many missions, including the one to St. Ezekiel's Cathredal where Mephisto captured them. While there, Mister Fantastic, along with his teammates, was subjected to his worst fears of having a lobotomy and becoming just another maniac. 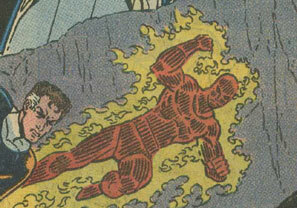 Reed was returned to Earth with the remaining the Fantastic Five members following the death of the Human Torch and the capture of the Silver Surfer. 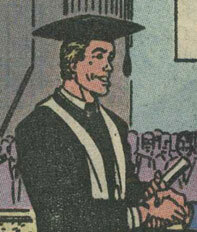 With Mephisto's demons occupying the Surfer, his influence was wiped from Earth and years later, Reed was proud to watch his son Franklin graduate with his doctorate. Reed had the same stretching powers that his 616 counterpart had. Mole Man was the same as his Earth-616 counterpart up until he met with a sound defeat at the hands of the newly-named Fantastic Five. Franklin was the same as his Earth-616 counterpart for the most part. He was born after the Silver Surfer joined the Fantastic Four and was present when Reed got the call from Father Coen asking the team to help him at St. Ezekiel's Cathredal. Years later, Franklin graduated college with his doctorate. Franklin presumably had the same reality-altering powers that his Earth-616 counterpart had, though he never showed them. Shalla-Bal was the same as her Earth-616 counterpart up until the Silver Surfer became stranded on Earth and joined the Fantastic Four. With the Surfer unable to leave Earth, Shalla-Bal was forever denied her love for the Surfer. Norrin Radd was the same as his Earth-616 up until he joined the Fantastic Four when he was unable to leave Earth. As a member of the newly-named Fantastic Five, the Silver Surfer helped make short work out of numerous villains until the team was sent to St. Ezekiel's Cathredal where Mephisto trapped them. Coercing the Surfer to stay in Hades to save his teammates, Mephisto tortured the Surfer for years while his influence on Earth waned. When Norrin pointed out Mephisto's loss of Earth, Mephisto quickly used the demons to re-infest the Earth, leaving the Surfer free to move around. The Surfer then coerced Mephisto into killing his physical body, leaving his radiating spirit to burn Mephisto for an eternity. The Silver Surfer possessed the same Power Cosmic abilities that his 616 counterpart had. Terminus was the same as his Earth-616 counterpart up until he met with a quick defeat at the hands of the newly-named Fantastic Five. 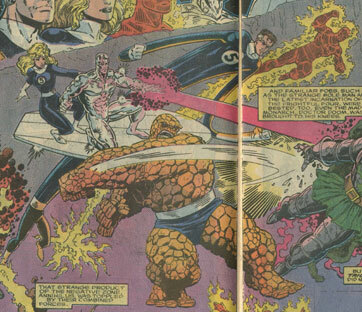 Ben Grimm was the same as his 616 counterpart up until the Silver Surfer joined the Fantastic Four. The newly-named Fantastic Five went on many missions before being trapped by Mephisto at St. Ezekiel's Cathredal where they were subjected to their worst fears. 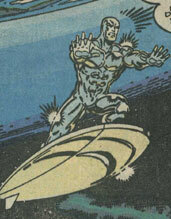 Ben was eventually freed, along with Reed and Sue, when the Surfer agreed to remain in Hades for an eternity. With Mephisto's influence gone, Ben joined Reed and Sue years later at Franklin Richards's graduation from college. 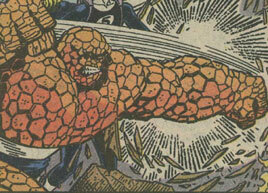 The Thing had the same superhuman strength and durability that his 616 counterpart had.